Cinema is not a profitable sector of the industry in Azerbaijan, with a population of about 10 million. If the first reason lies in the fact that, following the disintegration of the Soviet Union, no new film-market has emerged in the country, then the second and main reason is the fact that cinema is the monopoly of the state, as are many other areas. The only financial source for Azerbaijan’s cinema is the state budget, which means that the resources for a filmmaker to realize his or her ideas to a high level and to make a quality film are available only via the state budget. As a rule, the state prefers to finance projects which are within the state remits and correspond to its ideology. Consequently, the majority of films that have been made on state order in Azerbaijan cannot compete abroad. But there are also authors who do not wish to comply with the rules and try to make independent cinema on a low budget, and enter onto the international scene; one of them is the director and producer Teymur Hajiyev. Hajiyev has begun his career in film as producer and then continued as director. He shoots and produces his own films, preferably shorts. The first short film he produced was Torn (2014, dir. Elmar Imanov and Engin Kundag), which screened in the Directors’ Fortnight in Cannes; the second film was called The Wound, directed by Hajiyev himself and shown at Palm Springs IFF 2014; his latest and most impressive work is the short Shanghai, Baku (2015). Hajiyev has acted in this film not only as director and producer (second producer Rufat Gasanov), but also as one of the scriptwriters, together with Ismail Imanov. 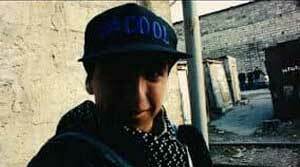 The plot of the film Shanghai, Baku is constructed around an event that has already become common in Azerbaijan society: the teenager and amateur director Samir accidentally and casually (in a hurry, he leaves the camera switched on) films his sister Roza kissing with a guy, Rasim. Understanding well that in the society where they live it could be harmful to advertise the relationship between an unmarried girl and a strange man and could have serious consequences, Samir starts to blackmail his sister. The protagonists of the film Shanghai, Baku are average Azerbaijanis. Rasim (Rasim Jafar) is one of thousands of young men who cannot find work in the country and goes to Russia to earn a living. The life of these people passes between Russia and Azerbaijan. Many of them have families both in Russia and in Azerbaijan. Rasim also falls into this category: by the end of the film we understand from a telephone conversation that he has a woman in Moscow. Roza (Roza Ibadova) is one of thousands of illiterate girls who, after leaving school (even without having done their finals), sits at home and is dependant on her parents; in most cases these girls are not allowed to work (and if so, every step is watched). In the society where she lives, it is a taboo for an unmarried girl to have an amorous relationship: not only is the loss of virginity before marriage at stake, but even innocent kisses are considered as disgrace and can end in tragedy. In her society, women receive the status of a full person only after marriage and childbirth. Therefore Roza’s only way to be released from the family fetters and get out from under the father’s control is to marry. For the entire film Roza only once protests against her destiny: when she is outside the territory of Shanghai, when she is on direct, smooth roads between high-rises. But her protest is a fleeting spark and dies away as soon as they return to Shanghai. Because these smooth roads, high buildings, and the clean city are nothing but an illusion: it is the Baku designed for tourists. 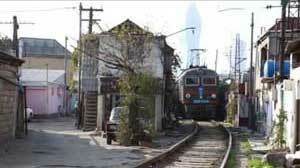 The reality is in Shanghai, the underbelly of the “clean” Baku. The place of action in the film is the settlement Shanghai; this is not a fruit of the director’s imagination, but a real place. It is a poor quarter in the centre of Baku, between the skyscrapers of the oil empire; it was named Shanghai because of the illegal housing, almost constructed on top of one another. 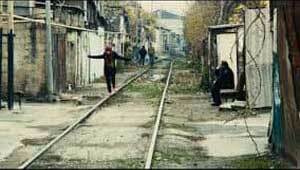 Among the streets, right before the doors of the houses, passes a railway line. Contrasting with the city at the distance of a kilometer or two, this settlement with its colorful inhabitants attracts more attention from tourists, international mass-media and filmmakers than the well-known FlameTowers. Placing the protagonists in this settlement and choosing a reporting style of the narrative with jump cuts, Hajiyev draws parallels to the social problems of the country and thus extrapolates his story from the framework of everyday issues to a global level. Shanghai, Baku has another hero: the camera (DoP Kirill Gerra). It plays the role of a public eye, which pursues the heroes everywhere; it is an amateur camera in the hands of Samir at home; a surveillance camera in the park; a dashboard safety camera in the car. During the filming, different cameras were used: Blackmagic pocket cinema camera, Panasonic GH4, GoPro 4, iPhone 5s, RED Scarlett, Canon Mark III. The protagonists are under total control. When Rasim and Roza decide to marry, thereby complying with social rules, Samir turns off the camera. But at the wedding it appears again. To be under control everywhere and always, to live for others and by the principle “what the people say” has become an integral part of their life, with which they have reconciled.